With new beginnings swirling around us, I thought it might be a fun diversion to make my first blog of 2017 a journey back to the beginning of Jewel’s career. 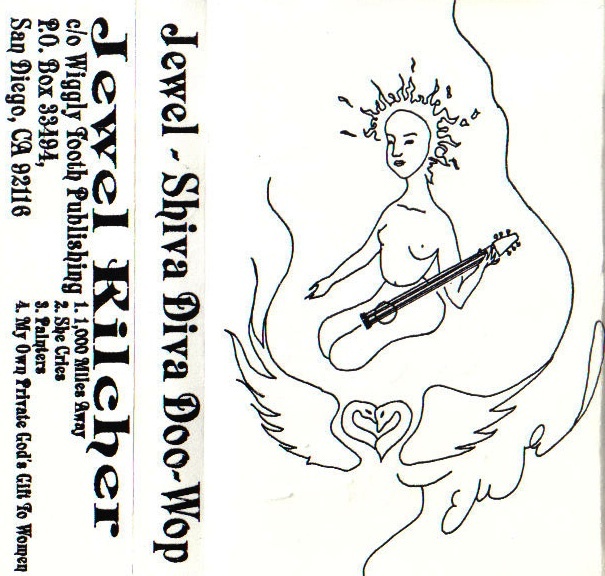 To put this in context, we’ll be heading back to October of 1994, when Jewel was one, among many, of the outstanding songwriters making their mark on the San Diego coffeehouse circuit. It’s difficult to convey just how vibrant that scene was at the time (and still is! ), but for this east coaster, it was a mind-blowing experience to discover such an abundance of highly original songwriting talent concentrated in one place. Jewel certainly didn’t emerge out of a vacuum. San Diego was home to a wide range of musical talent, but unlike many cities where songwriters tend to gravitate, everyone that I encountered was supportive of each other and they all seemed to take genuine pride in each others accomplishments. I have no doubt that this attitude helped Jewel gain confidence and nurtured her along during those early days. Another priority at the time was to create an EPK (electronic press kit), to help Atlantic Records market the album and first single, “Who Will Save Your Soul,” to radio programmers upon release the following February. For this project, she recruited 91X program director Mike Halloran. Mike not only had experience in this area, but he, along with 91X DJ Lou Niles, had been a strong supporter of Jewel’s music for some time. Recently I was scouring through archive footage and I located several working edits from when that EPK was in preparation. Before you explore this footage, I’d like to add that if you enjoy things like this, I encourage you to click the History tab in the site menu at the top of this page. Not only will you find additional footage from this EPK and an abundance of EDA-relevant content, you’ll find a virtual travelogue through most of the key events in Jewel’s life and career - from her childhood in Alaska right up to the present day. Navigation is simple and features several options (via timeline, locations or tags). so its easy to find what may interest you the most. But most important, you are invited to contribute! You can enhance the content by adding your own concert photos or memorabilia or better yet, by posting your own thoughts, experiences and recollections on any given entry. Regardless of how much you already know, you can easily get lost for hours in there. If you ever wondered what it's like inside the Jewel compartment of my brain, it also provides a good glimpse of the tip of that iceberg. OK, onto the footage I’d like to share with you today. This is a working edit that contains three sequences, shot in October of 1994, that would later be featured in the EPK. 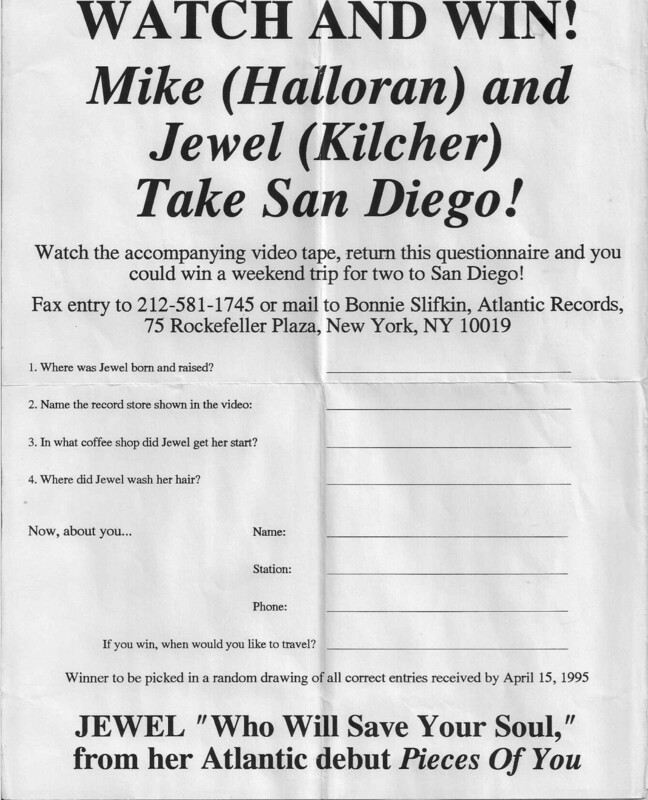 It includes Jewel surfing at Wind & Sea beach, amusing cameos by Rugburns members Steve Poltz and Gregory Page filmed at Steve’s apartment (including a clip of Jewel and Steve singing “You Were Meant For Me” long before it changed their lives) and concludes with a 21 year old Jewel conveying the significance of the San Diego music scene and how she was feeling at this pivotal moment in time. Below the video is the insert that was included with the EPK when it was sent out to radio station programmers the following February.